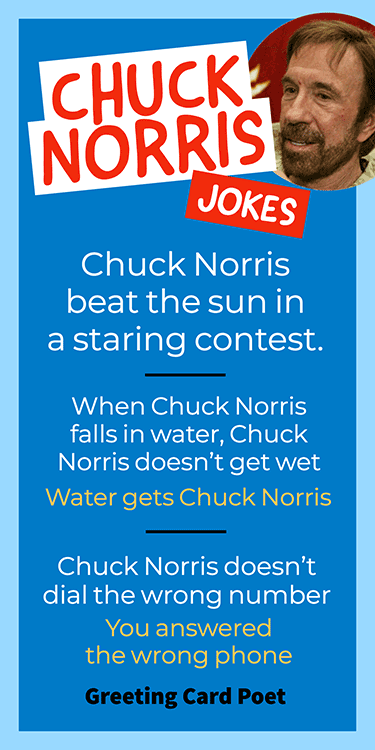 This top Chuck Norris jokes list spawned from some of the funniest facts out on the internet! Known as one of the the manliest men in history, mythical character Chuck hears everything and has become a prevailing theme in pop culture. 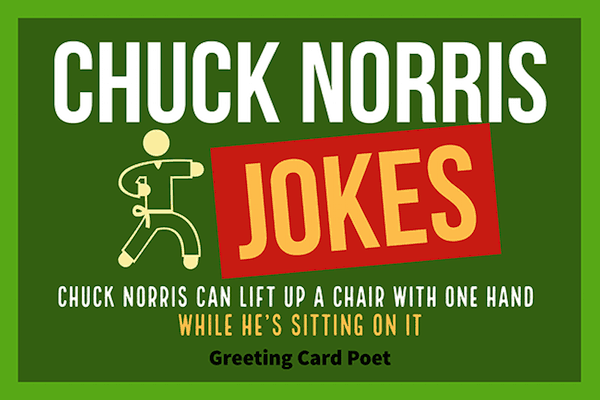 In fact, history suggests that Chuck Norris jokes initially started in 2004 when late night show comedian Conan O’Brien started sharing “Walker: Texas Ranger” jokes whenever one of his comedy efforts headed south. Soon, a cult following emerged. This venerable star of countless classic movies is so tough and so uncrossable, that the only sensible thing to do was compile a collection of jokes to tempt a fate worse than death at the hands of Chuck Norris. Beware of his wrath, should you choose to downvote any of them! Chuck Norris once went to court for a crime. The judge pleaded guilty. When Chuck Norris turned 18, his parents moved out. Sand is created by Chuck Norris shouting at rocks. Chuck Norris broke the law once. It still isn’t fixed. Chuck Norris can teach an old dog new tricks, and teach a new dog old tricks. Sticks and Stones may break your bones, but so will Chuck Norris. Chuck Norris can lift up a chair with one hand. While he’s sitting on it. Chuck Norris was once bitten by a rattlesnake in the desert, and after 3 days of pain and agony, the snake died. Chuck Norris once uppercut a horse. It’s descendants are now known as the giraffe. Before he goes to sleep each night, the boogeyman checks his closet and under his bed for Chuck Norris. Chuck Norris can ride a wheelie. On a unicycle! Check out our best Cheesy Jokes. When Chuck Norris does a push up, he pushes the earth down. Chuck Norris doesn’t breathe air. He holds air hostage. Chuck Norris was born in a log cabin… That he built with his bare hands. Chuck Norris plays four square with a bowling ball. Chuck Norris’ favorite candy are jaw breakers. Why did Chuck Norris cross the road? No one ever dared to ask him. Chuck Norris is the only person that can punch a cyclops between the eye. Chuck Norris doesn’t shave; he kicks himself in the face. The only thing that can cut Chuck Norris is Chuck Norris. Chuck Norris eats at Chick-fil-A on Sundays. If you can see Chuck Norris, he can see you. If you can’t see Chuck Norris, you may be only seconds away from death. Chuck Norris once made an happy meal cry. Children are afraid of the dark. The Dark is afraid of Chuck Norris. There is no chin behind Chuck Norris’ beard. There is only another fist. Chuck Norris once threw a grenade that killed 20 people. Then it exploded. Sharks have a week dedicated to Chuck Norris. Chuck Norris doesn’t dial the wrong number. You answered the wrong phone. Chuck Norris can breathe underwater. The government pays Chuck Norris taxes. Chuck Norris can’t break the law. Chuck Norris is the law. There are no weapons of mass destruction. Just Chuck Norris. Chuck Norris can speak in Morse code. Chuck Norris’ hand is the only hand that can beat a Royal Flush. When Chuck Norris works out he doesn’t get stronger, the machine does. Who can build a snowman out of rain? Chuck Norris. Chuck Norris CAN find the end of a circle. Mistakes learn from Chuck Norris. Elvis called Chuck Norris the King. Chuck Norris can find the needle in the haystack. Do you have any suggested Chuck Norris Jokes? Let us know via the contact page. How Old is Chuck Norris? Chuck Norris’ age is 78-year old. He’s modern day living legend, who by no means is anything like your average dude. He’s best known for his classic TV series Walker Texas Ranger, but thanks to the internet, Chuck has evolved over time into a persona of unstoppable force with a knack for achieving the impossible. He keeps his youthful look by working out on the Total Gym, which you may have noticed in an infomercial or two. You’re on the Chuck Norris Jokes page.